Origin and Habitat: Northern Mexico (Coahuila, Durango, Nuevo Leon, and Tamaulipas, Mexico). Type locality: Near Monterey, Mexico. Altitude: It grows at elevations of 350 to1,800 metres above sea level. 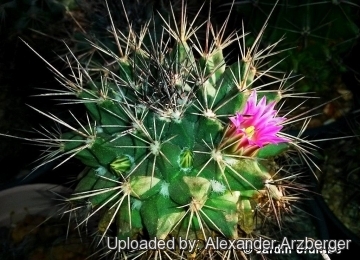 Habitat and Ecology: The species has been seen growing on steep cliffs walls and in large flat areas in shrublands together with Mammillaria plumosa, Mammillaria salfordii, Mammillaria carretii, Mammillaria candida v. estanzuelensis, Thelocactus nidulans, Thelocactus bicolor, Gymnocactus beguinii, Ferocactus hamatacanthus, Lophophora williamsii, Echinocereus stramineus, Astrophytum capricorne, Opuntia imbricata, Opuntia microdasys and Yucca thompsoniana. Illegal collection and overgrazing of the habitat by goats may be a threat to this species. Mammillaria runyonii (Britton & Rose) Boed. 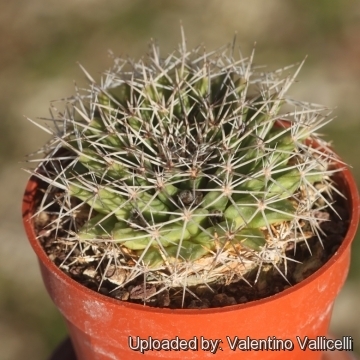 Description: Mammillaria melanocentra is a short, stocky and glaucous perennial cactus species with large tubercles. Each head is surrounded by a complete ring of star-like dark pink flowers. Stem: Depressed-spherical, to short-cylindric and rather flattened at the top, up to to 16 cm high and 10-12(-15) cm in diameter, glaucous-green. Tubercles: in 8 and 13 spirals, firm, large, pyramidal, strongly four-angled, keeled up to about 1.4 x 1.4 cm, their axils with much white wool at first, without bristles. With latex. Radial spines: (4-)6-9(-13), stout-subulate, (6-)15 to 20(-22) cm long, white, brownish or black, unequal, the lowermost longest. Central spines: Usually solitary, occasionally up to 3, stout, awl shaped, usually ascending, black when young, later light grey, 2 to 3 cm long, greatly overtopping the stem black, becoming brownish grey later. Flowers: Whitish to bright pinkish red or carmine with darker midline, approx. 2 x 2 cm long and in diameter, the segments linear, acute. Blooming season: Flowers are produced in spring over a several weeks period. Fruits: Pink or red, club-shaped, pink to scarlet, to 30 mm long. Mammillaria melanocentra Poselg. : (subsp. 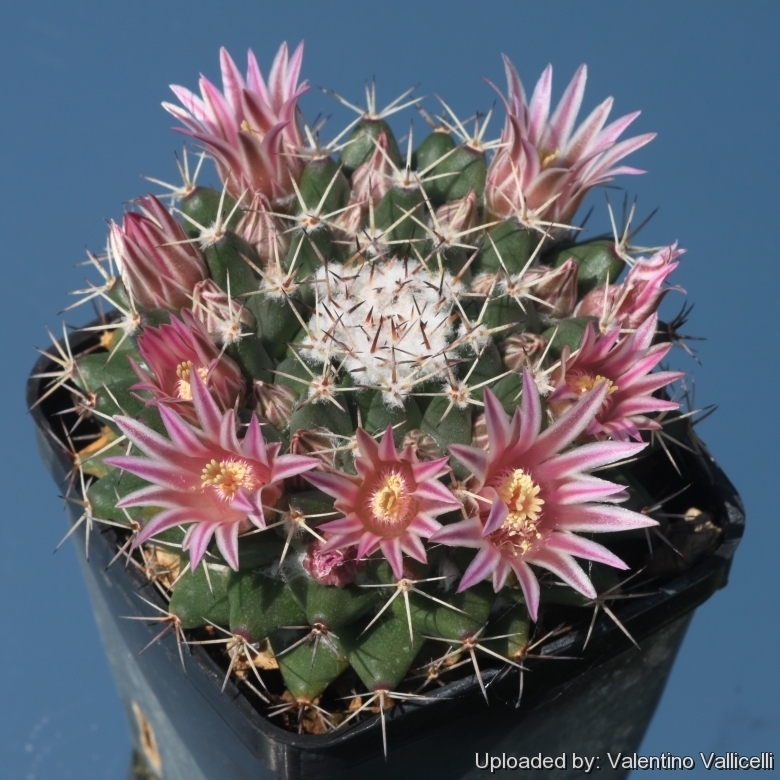 melanocentra) has 7-9 black to gray radial spines and bright, deep pink flowers. Distribution: Coahuila, Durango, and Nuevo Leon. Mammillaria melanocentra subs. linaresensis (R.Wolf & F.Wolf) D.R.Hunt: has 4-6 white radial spines and whitish flowers. Distribution: Linares and adjacent areas, Nuevo Leon. Mammillaria melanocentra subs. rubrograndis (Repp. & A.B.Lau) D.R.Hunt: has 11-13 yellowish brown radial spines and bright carmine flowers. Distribution: Tamaulipas and Nuevo Leon. 1) Fitz Maurice, B, Fitz Maurice, W.A., Hernández, H.M., Sotomayor, M. & Smith, M. 2013. Mammillaria melanocentra. In: IUCN 2013. “IUCN Red List of Threatened Species.” Version 2013.2. <www.iucnredlist.org>. Downloaded on 11 February 2014. 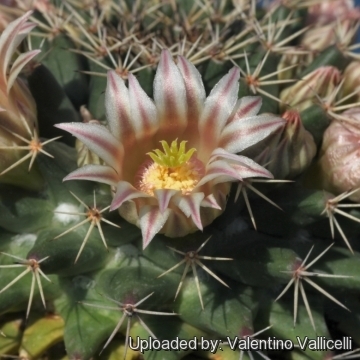 7) John Pilbeam (1999) “Mammillaria The Cactus File Handbook” Nuffield Press. 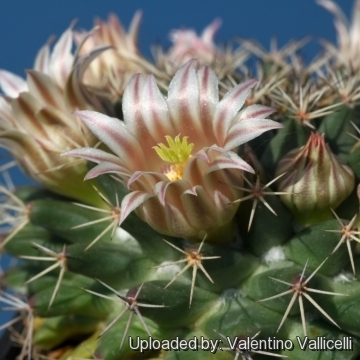 Cultivation and Propagation: Mammillaria melanocentra is a free-flowering and relatively easy plant to grow.